We managed to get the potatoes planted yesterday, before the rain soaked the soil too much. Hopefully in three weeks, the potato plants will be poking above the surface of the soil. Today, the soil temperature in the covered box is 13 degrees celsius, while the other boxes are 12 degrees celsius, so our plastic cover has improved the soil temperature. We are edging closer to be able to plant our tomatoes. Once it reaches 14 or 15 degrees celsius, our tomatoes will be happy. This week, we will try to harden off the tomato seedlings by putting them outside temporarily. They are looking a bit stressed I think at being in such small pots. Hopefully we will get some sunny days to heat up the soil, because I don't think they like being confined. The peas will be planted in the East Box, between the two tall poles. Just push them into the ground about 1.5 cm deep. Gently pat down the soil. I have already put some mushroom manure in the area, so that should help them grow. Easy peasy. If it is raining, you can choose whether or not to plant potatoes, but it probably isn't a good idea. If you want to plant potatoes, first test the soil by squeezing some in your hand. If it crumbles, the soil is OK to dig. If it forms a ball, do not do any digging, as it will harm the soil structure, causing hardened balls of soil to form. The potatoes will be planted in a row in the East Box, along its West side. The row will run North/South from the hose container to the kale, parallel to the row of peas. The potatoes should be planted about 20-30 cm from the edge. To plant a potato, dig a hole about 30 cm deep. Sprinkle a small amount of bone meal into the hole and lightly mix it around. Place the potato with the shoots facing upwards (the shoots will become new plants). Bury the potato, and lightly pat the soil. The potatoes should be spaced about 30 cm from each other. Don't put more than one potato in the same place. In a few weeks, the potato plants will pop out from the ground...when they do, it is time to plant pole beans! Here is some detailed background information if you are interested. I measured the soil temperature in the centre box today...it is 11.1 degrees celsius six inches down. 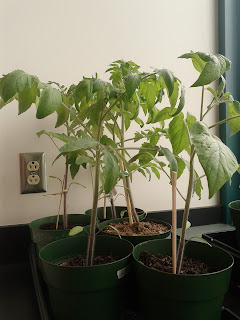 From what I have read, tomatoes prefer soil temperatures around 20 degrees celsius, though we can probably plant when the temperature is around 14 degrees celsius. We have put the plastic cover over the central box...hopefully that will raise the soil temperature. Still, if we plant our seedlings now, they won't be terribly happy. I'll keep checking the soil temperature. When we do plant them, we will plant them a bit sideways. We'll pinch off some of the lower leaves, while leaving lots of upper leaves. Then we'll dig a hole and put the tomato in sideways, slanted upwards. We'll leave the leaves above ground, but bury the stem. The stem will then form more roots, making the plant stronger. Here is an illustrated guide. 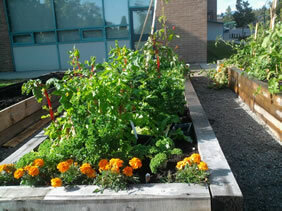 We have a gardening session on April 11, 2012 after school. Squeeze some soil in your hand. If the soil holds its shape as a ball, the soil is too wet to work with. If the soil crumbles after being squeezed, it is safe to dig the soil. If the soil fails the wetness test, all we need to do today is put up the plastic cover. If the soil passes the wetness test and crumbles when squeezed, then evenly spread all the bags of mushroom manure and Sea Soil over the middle box and mix it in with shovels. Then put the plastic covers up. You may remove the support pipes when working the soil. The plastic cover will help warm the soil, so we can plant out tomatoes early. The east box has kale and a crimson clover cover crop, in addition to the herbs at the south end. We will probably not let the clover cover crop grow to maturity. The plan is to plant pole beans in the north end, once it gets warm enough. We will also plant a row of potatoes near where the beans will be. Apparently beans and potatoes are excellent companions. We will plant the seed potatoes soon, possibly this Wednesday, if the soil isn't too wet. The idea is that when the potato stems pop out of the ground, it is warm enough to plant the beans. I bought some Yukon Gold seed potatoes, and I also had some old sprouting purple potatoes that have been sitting in my kitchen for far too long. Both of these types of potatoes are quite yummy, and sought after in food stores. Another idea, if we want is to plant some snap peas, and have them climb a trellis. If we do that, we should do it soon. The idea will be to remove the peas at the same time that we plant the beans. The rye cover crop is now turned, and the apple trees have been transplanted to the big pots. We will eventually put the apple trees in the ground, but I think they will be okay in the pots for one season. The tomato seedlings are doing well, and were well watered in preparation for being alone over Easter. When we plant the tomato seedlings depends on the temperature, and especially the soil temperature. Even if the air gets warmer, the soil may stay cool for a while longer. To help with this, I think we should put up the plastic cover over the centre box soon, in order to cause something of a greenhouse effect for the soil. If we do this, I think we might be able to plant the tomatoes in two or three weeks. There are a number of things we can plant with the tomatoes, and we can discuss that later. The garlic seems to be doing well. The broccoli seems to be ready to flower soon, and looks somewhat healthy. Last week we removed the cauliflower crop since it was not looking healthy. The lettuce we planted seems happy in the soil, and is growing visibly every day. In a few weeks, the cooking classes will be able to harvest fresh lettuce. The chard we planted is still alive, and is probably developing its root system. Once it gets warmer, I suspect it will start to grow quite quickly. Our compost bins are still maturing. The north bin was hasn't been so happy lately, mostly since it stayed locked for a long time. Parts of the waste got quite dry, which does not help the material decay. This week we put some fresh waste in the bin, which should give some food to the decomposers. I also put some dirt in the north bin, along with some dried leaves. The idea is that the dirt contains worms and other decomposers. The zone of dirt provides a comfortable location for the organisms before they venture out into the fresh waste. I believe the leaf cover layer also provides a place for the worms to go when conditions below aren't ideal. When we add new waste to the compost bins, I think it is important to bring down a shovel, and to pull back a hole in the compost into which the fresh waste will be deposited. While you pull back the compost, you are also helping to aerate the compost, preventing smelly anaerobic decomposition. If we do this regularly, our compost pile will eventually come to life, and become more self-sufficient. I don't think the compost in our bin is fully ready to be used in the garden, though I'll check it again in a couple of weeks. If it isn't ready, that's okay. We'll just wait until next year, and add a third bin. In the mean time, I have bought some mushroom manure, and some sea-soil to mix into the soil. If the weather is dry, we can put this into the soil this week. Wed. (April 4th) after school with MEC! 2. remove top soil of grey pots (along with cilantro and mint) into compost bins?